1Department of Chemistry, Shahrood Branch, Islamic Azad University, Shahrood, Iran. An ab initio and density functional theory (DFT) study about conformational analysis of tripeptide model HCO−GLY−L−ILE−GLY−NH2 is presented. 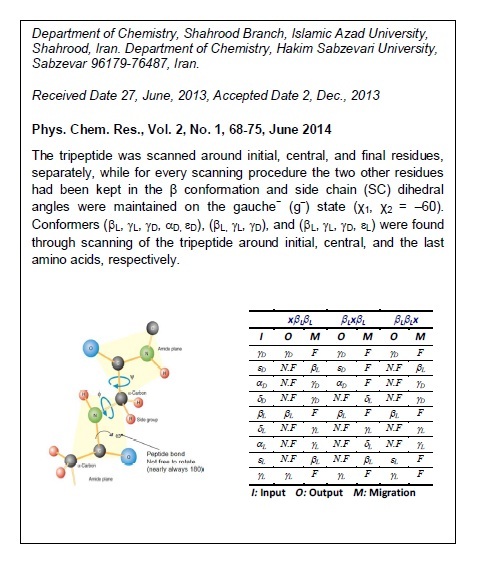 The tripeptide was scanned about initial, central, and final residues, separately while for every scanning procedure the two other residues had been kept in the β conformation and side chain (SC) dihedral angles were maintained on the gauche− (g‾) state (χ1, χ2 = ‒60). Conformers (L, L, D, D, D), (L, L, D), and (L, L, D, L) were found through scanning of the tripeptide about initial, central, and the last amino acids, respectively. At first, geometries of all conformers were optimized at the HF/6-31G (d) and B3LYP/6-31G (d) levels of theory. In the followings, their thermodynamic properties were obtained with performing of the frequency calculations at the same levels used for optimization. Finally, comparison of the calculated thermodynamic results of the found conformers to the tripeptide minima on Ramachandran map as the standard criteria proposed LLL as the most stable one. H. Rangwala, G. Karypis (Eds. ), Introduction toProtein Structure Prediction: Methods and Algorithms, J. Wiley, New York, 2011. H. Eshtiagh-Hosseini, M. Chahkandi, M.R. Housaindokht, M. Mirzaei, Polyhedron 60 (2013) 93. M. Mirzaei, H. Eshtiagh-Hosseini, M. Chahkandi, N. Alfi, A. Shokrollahi, N. Shokrollahi, A. Janiak, Cryst. Eng. Comm. 14 (2012) 8468. M. Mirzaei, H. Eshtiagh-Hosseini, M. Mohammadi Abadeh, M. Chahkandi, A. Frontera, A. Hassanpoor, Cryst. Eng. Comm. 15 (2013) 1404. H. Eshtiagh-Hosseini, M. Mirzaei, M. Biabani, V. Lippolis, M. Chahkandi, C. Bazzicalupi, Cryst. Eng. Comm. 15 (2013) 6752. B. Chahkandi, S.F. Tayyari, M. Bakhshaei, M. Chahkandi, J. Mol. Graph. Model. 44 (2013) 120. A. Karton, R.J. O'Reilly, L.J. Radom, J. Phys. Chem. A 116 (2012) 4211. S. Nachimuthu, J. Gao, D.G. Truhlar, Chem. Phys. 400 (2012) 8. 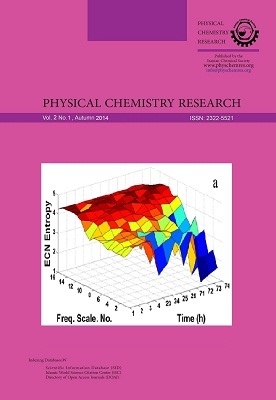 N. Kobko, J.J. Dannenberg, J. Phys. Chem. A 107 (2003) 10389. V. Daggett, Chem. Rev. 106 (2006) 1898. A. Ben-Naim, J. Phys. Chem. 95 (1991) 1437. C.M. Dobson, J. Trends Biochem. 24 (1999) 329. C.D. Keefe, K.J. Pearson, J. Theochem. Canada 679 (2004) 65. C.M. Dobson, Phil. Trans. R. Soc. Lond. B 356 (2001) 133. A. Perczel, O. Farkas, I.G. Csizmadia, J. Mol. Struct. (Theochem.) 540 (2001) 271. R.S. Corey, L. Pauling, The Fundamental Dimensions of Polypeptide Chains, London, 1953, p. 10-20. A.V. Mikhonin, S.V. Bykov, N.S. Myshakina, S.A. Asher, J. Phys. Chem. B. 110 (2006) 1928. B. Chahkandi, B.S. Hosseini, Wseas Transactions on Biology and Biomedicine 6 (2009) 89. S. Basu, D. Bhattacharyya, R. Banerjee, Biophysical J . 102 (2012) 2605. B.E. Bowler, Curr. Opin. Struc. Biol. 22 (2012) 4. G.N. Ramachandran, C. Ramakrishnan, V. Sasisekharan, J. Mol. Bio. 7 (1963) 95. L. Pauling, H.R. Corey, H.R. Branson, Proceedings National Academy of Sciences USA 37 4 (1951) 205.
 a) G.N. Ramachandran, V. Sasisekharan, Y.T.T. Hathachari, Structure of Collagen at the Molecular Level in collagen, J. Wiley, New York, 1962, p. 81-115; b) G.N. Ramachandran, M. Bansal, R.S. Bhatnagar, Biochimica et Biophysica Acta (BBA)-Protein Structure 322 (1973) 166. G.N. Ramachandran, V. Sasisekharan, Adv. Protein Chem. 23 (1968) 283. E. Hcilbronner, J. Pure. Appl. Chem. 40 (1974) 291. N.I. Phillipsa, R. Jenness, J. Biochim. Biophys. Acta 229 (1971) 1. A. Perczel, O. Farkas, I.G. Csizmadia, J. Am. Chem. Soc. 117 (1995) 1653. H.A. Baldoni, G.N. Zamarbide, R.D. Enriz, E.A. Jauregui, O. Farkas, A. Perczel, S.J. Salpietro, I.G. Csizmadia, J. Mol. Struct. 500 (2000) 97. S. Miyashiro, H. Enei, Y. Hirose, S. Udaka, Agric. Biol. Chem. 44 (1980) 105. A. Perczel, M. Kajtar, J.F. Marcoccia, I.G. Csizmadia, J. Mol. Struct. (Theochem.) 232 (1991) 291. G. Endredi, A. Perczel, O. Farkas, M.A. McAllister, G.I. Csonka, J. Ladik, I.G. Csizmadia, J. Mol. Struct. (Theochem.) 391 (1997) 15. M.J. Frisch, et al. GAUSSIAN 98, RevisionA.9, Gaussian, Inc., Pittsburgh Pople, PA, 1998. C. Lee, R.G. Parr, W. Yang, Phys. Rev. B 37 (1988) 785.